I have always known a skyscraper to be a thing with the tall buildings, but tagging a horizontal building as a ‘skyscraper’ is what baffles me a lot. However, while saying is not very believing, seeing such a building in the reality confirms the fact that such is not just a sane talk, but rather a fact. To some people, the horizontal skyscraper is a work of art while to several other, is just an ordinary structure targeted at attracting tourist and other city people to the topmost part of the building, however, it still does not write off the fact that it is still not different from any other skyscraper apart from the fact that the horizontal structure only serves as a linking bridge between the four actual skyscraper. Designed by Israeli-Canadian architect Moshe Safdie, the structure echoes the architect’s famous @5.7 billion “SkyPark” at the Marina Bay Sands in Singapore, which was completed in 2010 and takes a similar approach to connect independent skyscrapers with a bridge of entertainment and recreation spaces. However, the Crystal is fully covered by a glass vault that, according to the developers, was inspired by old sailing ships. It’s an apt reference since the project is situated at the confluence of the Yangtze and Jialing rivers in central China. 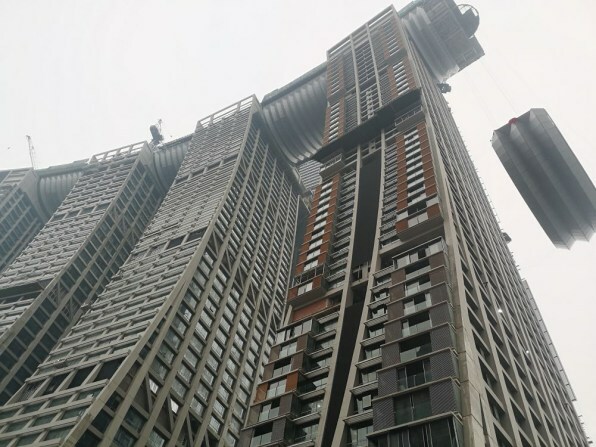 The building is said to be situated a little above the average skyscraper, reaching the height of about 850 feet, but definitely not the tallest building the country. Thanks to a replicate of this engineering wonder which is located in The Kingdom Centre in Saudi Arabia, whose 300-ton bridge floats 992 feet above the ground. Still, Safdie’s Crystal is in some ways more impressive than other well-known sky bridges–both because it links more towers than any other and because its construction makes it more akin to a distinct skyscraper than a simple connecting bridge. Of course, nothing good comes easy, and you can testify to that after watching the video below that describes how complex the process of building the structure was. The Crystal as the building is been called will be one of the most sophisticated projects in the city, and as fact is concerned, the Raffles City Chongqing which is the building’s alternative name matches the fact that the 12-million-square-foot complex composed of eight skyscrapers will contain a 2.5-million-square-foot mall, 1.6 million square feet of office space, and 1,400 residential apartments. The building is expected to be complete and operative in the second half of 2019. Until then, what the experience inside is going to look like is still unknown, but as expected- it is supposed to be a mini-city kind of setting.